Hi Stuart, send pics and explanation directly to SW service so they can investigate and reprint. Sadly their QC has gone down the pan lately, as they tend to outsource a lot of their printing, so SW HQ may not know what is being sent out in their name. Took a bit longer than expected but a set of 4 rifles is now ready. The set includes 1 each of the M110, Cheytac M200, McMillian TAC-50, and the new FN SCAR-H SSR and magazines and bipods for each. All sets will be available by end of day tomorrow. All non-suppressed and 4-pack sets are available now. Mike-The 35 scale guitars are fun. Thank you. Here is your Gibson Explorer 3D where I tried to paint in Lynyrd Skynyrd scheme. Need to string it up and try some Freebird! I would 2nd the vote for an A3 and/or an A4 HEMTT conversion kit but I suspect that would get kinda pricy! How about HVSS type wheels for late-war Sherman tanks? There are resin and styrene wheels out there with hubcaps and lug bolts molded in place, but spare wheels should have neither. One set on Shapeways offers a pair of them for Korean War Shermans, but they are printed with the Tokyo Depot mounting brackets installed. Loose wheels would be needed if one wished to add them to the stowage for a World War Two era tank. While we`re on the subject.... Conversion parts for HEMTT A4 would be great. At least the air-ride suspension and the cooling louvers. Again reference material is in the house. I would like to install at least one of your older style A/C units in my 8x8s but don't have the proper condenser to go with it. 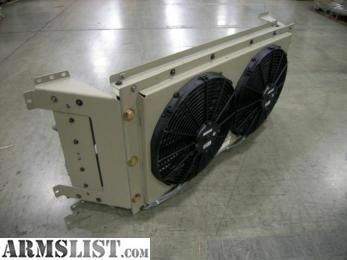 A set of housing for A/C unit underneat the rear sponsons of the M1151. Saves money avoiding Legend Productions update set. P.S. Photos of the housing are here on my HD. Removed by original poster on 08/24/18 - 21:31:56 (GMT). 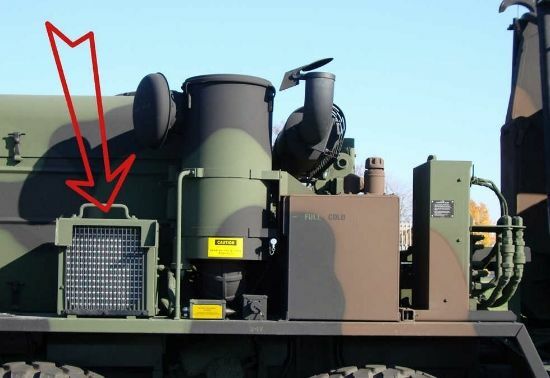 Is it possible to make the training device that sit on the m1a2 abrams , the big box that sit on the turret side? If you have good photos.? I dont have so many photos but somebody else here may have it ? I can not add photo here as i dont know how to do it.. The device is called Main Gun Simulator System. I photographed one on an OPFOR track. Can you get me some pictures so I know what I need to look for? 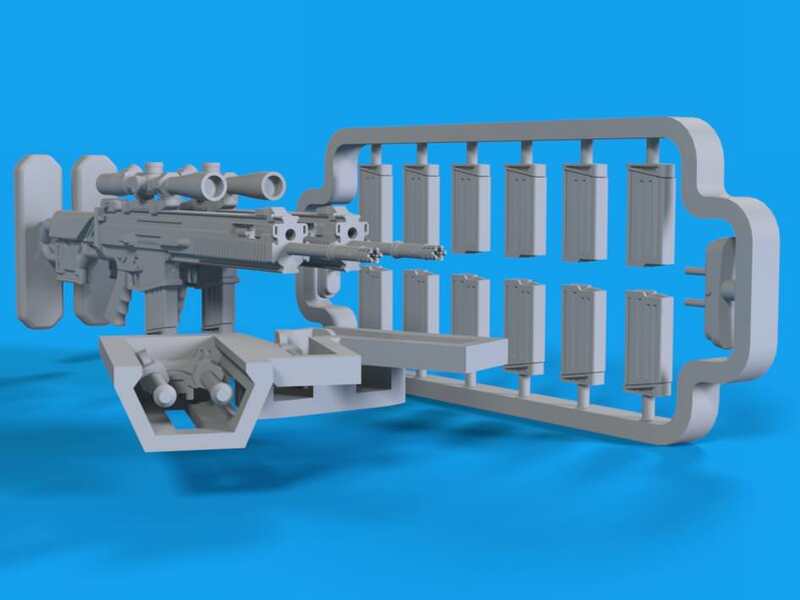 For Håkan and J.
Michael i have sent you email with a photo and one more proposal for stryker kit.. maybe it's not possible to make it but in case..
How about the new long 30mm chain-gun with rws for the MARP? Or the gutter for the new Stryker Dragoon. Yep, I saw it. I can fix the flagged areas tomorrow. We have flagged this model from the Order and contacted the designer/owner of the model to see if they can update it. If no action is taken by the designer, the product will be canceled in 7 days and a refund will be issued in a few business days after cancelation. Also, this might be the final, or one of the final, progress updates on the SR-25/M110 project. Pretty much everything "new" is finished. 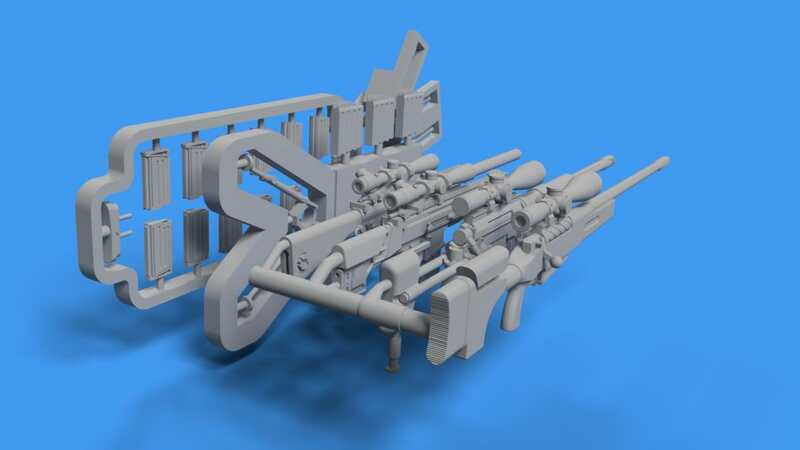 All that's left is to provide the separate opened and closed bipods, a set of guns with/without silencers, one gun per set with extended stocks and a set of magazines. Basically two or so more hours and it'll be finished. 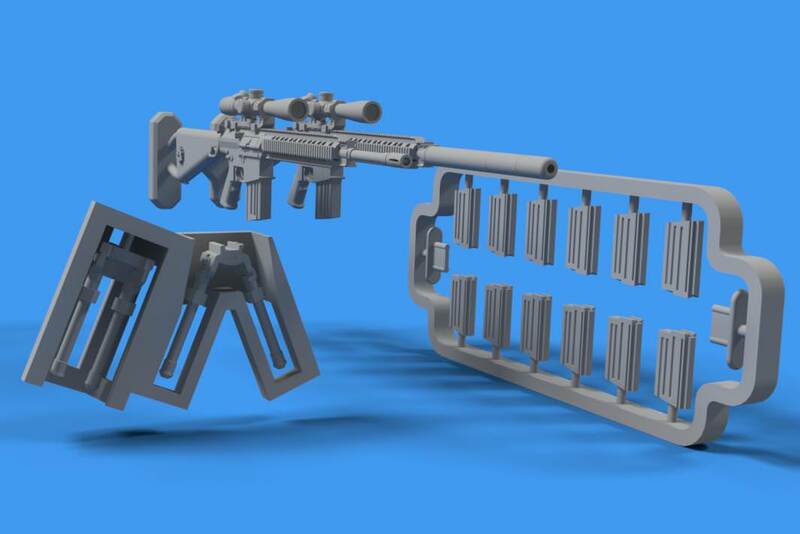 I ordered a test set with the gun and bipod to test a method of attaching the bipod and see if it will print. For now, I need a question answered. Should this set also be offered with flip-up iron sights flipped up (no scope)and/or rail covers attached as well? Or just plain with scope (and silencer set) like shown? I have a future possible plan to offer one each of all the rifles in a single set. Still just a thought. 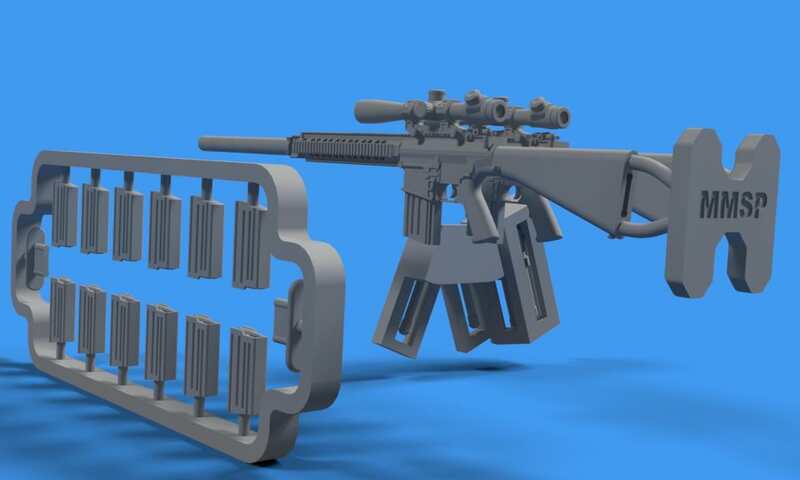 I vote all the rifles in a single set please! Ok. I also have a surprise project that will be included in that set. That project will be started sometime tomorrow. Any chance you could finish up the supports for the CHU? I want to get your CHU set, but we also need the supports to have a complete CHU. Ditto on this request - I know it is a sticky problem - I am trying to scratch build the rear supports but a lack of information is my stumbling block as well. That's the problem and why I can't finish it completely. If I had more information (relatively detailed measurements, more pictures and the like) it would be a bit easier but so far all I can do is make a rectangular box with a hollow square profile. I can't get any more until there's more information. If anyone knows anybody or is around vehicles with CHUs that could get that information, it'd be wonderful if they take some measurements. 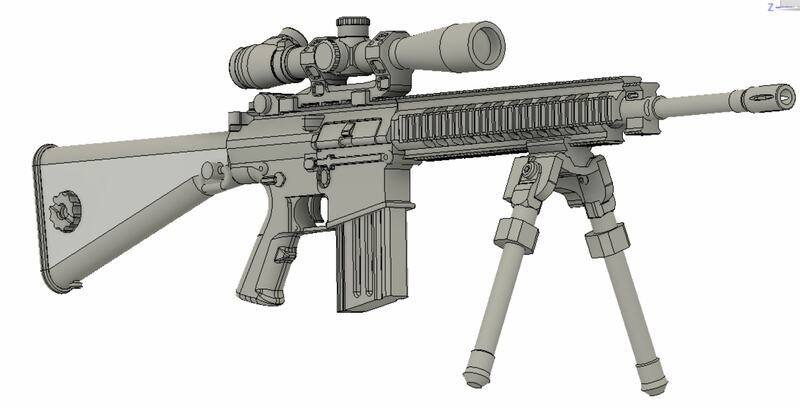 hi, does anyones know if the project exists M1165 gmv ? I'm not sure what would be needed for these vehicles so you'd have to send me pictures/diagrams of what is needed. They wouldn't be difficult to print but I can't design figures. 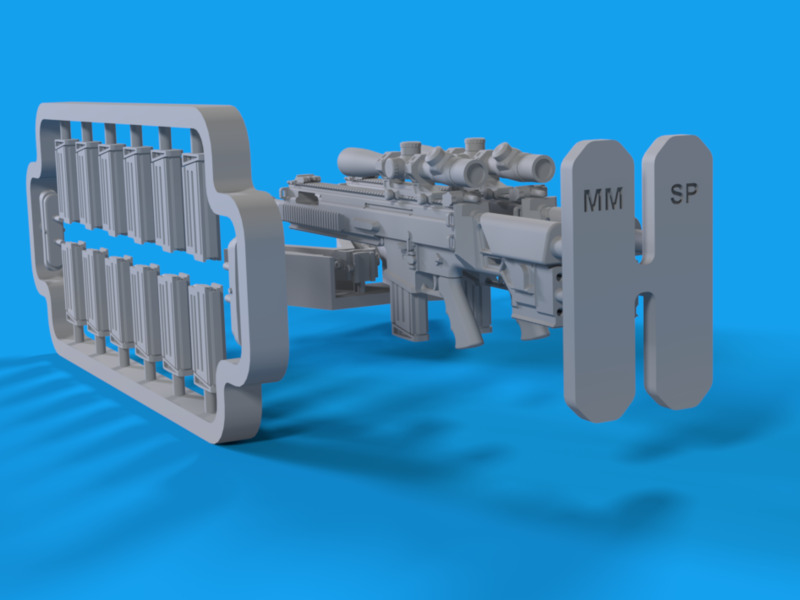 Weapons aren't all that difficult but designing them to be printed by Shapeways in small scale is. A lot of detail would be lost and what detail there is would be very clunky. Shapeways is very finnicky because they print for wide-production so they want to ensure that what is printing is printable from the start. Reedoak doesn't have as much of this restriction so they can print much finer and more detail than Shapeways is willing to. There's another producer on Shapeways that does ratchet strap ends in 1/10th. I sent him/her a msg to see if it could be done in 1/35. I'll see if I get a response. If not then maybe some tie down strap ratchets in 1/35. Would be applicable to a lot of modern trucks/trailers/etc. 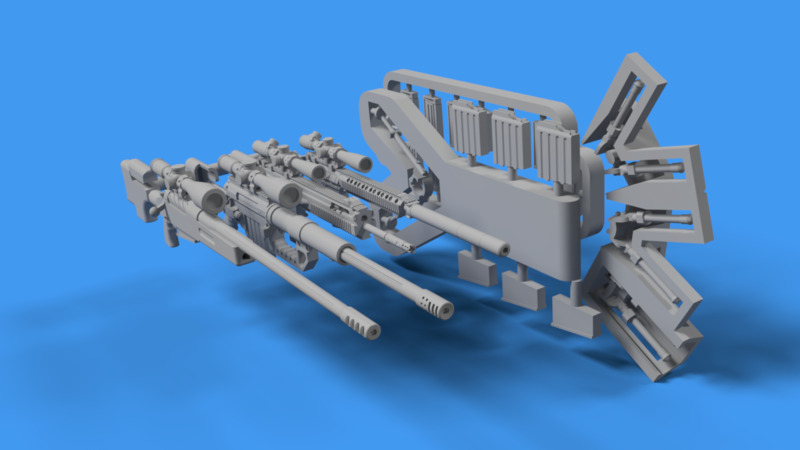 I'm not all too sure how printable they'd be in 1/35 though. They can be designed but they'd also be very small and the strap opening wouldn't be very large.